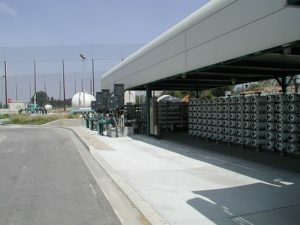 Irrigation facility treating secondary effluent from Hyperion WWTP. The 2.5 mgd expansion increased capacity of the Barrier Plant to 7.5 mgd, and marked one of the first large scale applications of an integrated membrane system for wastewater reuse. SPI prepared design and procurement documents for the MF-RO treatment train and new chlorine contact tank. The project was implemented under a design-build procurement approach, with SPI preparing bidding documents for the MF and RO equipment.